I want to have the user specify a date in a custom form. This date will append the current URL with the date value path/YYYY-MM-DD/ I then need to capture the date and use it to filter data from the database to display that date’s data. I’m using class based views and for the report I’m using generic view since this view is a custom report I’m building using multiple db models. The view Report is responsible just for validating the user input and redirecting the user to the view that will actually process the report, which is ReportDetails. The form is posted to Report. 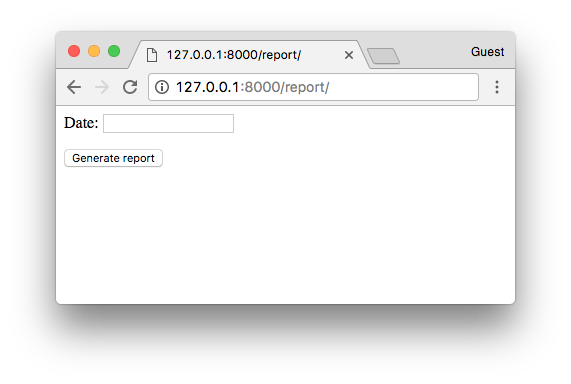 Report validates the input and if it is valid, it fires a redirect towards the ReportDetails. 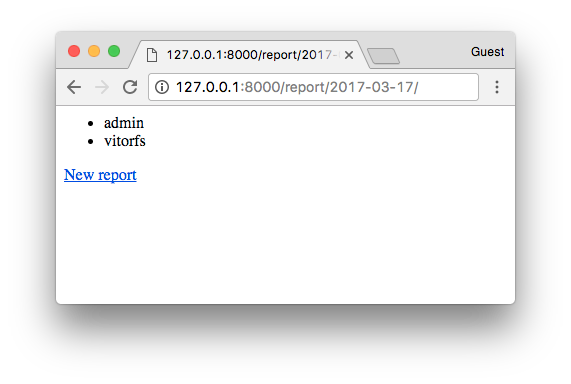 ReportDetails grab the date information from the URL, process the querysets and finally returns to the user, rendering the template. This implementation will only work if you only need the date to filter the report. If you need to pass extra information to do the filtering of the querysets, I would recommend sending the form data directly to the Report view. And perhaps even using a GET request, because you are not modifying the data. Then you would end up having a URL like this: /report/?date=2017-03-17. And if you had more information in the form, like the status, it would append in the URL: /report/?date=2017-03-17&status=pending. The URL would still be friendly, and the implementation would be simpler. The code is available on GitHub: github.com/sibtc/askvitor.